The highly versatile Cascade provides a combination of 16 snack/confectionery selections and 8 cold canned drink selections. Standard dual snack spirals provide a superior vend action. Large capacity can module. Comprehensive sales audit facility improves stock control and provides a detailed activity log. Continuous price rolls enable pricing to be changed quickly and easily. 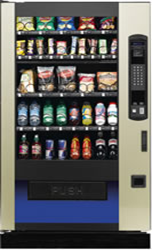 The highly versatile Cascade provides a combination of 20 snack/confectionery selections and 10 cold canned drink selections. Standard dual snack spirals provide a superior vend action Large capacity can module Comprehensive sales audit facility improves stock control and provides a detailed activity log Continuous price rolls enable pricing to be changed quickly and easily. Want more information? Call us on 01254 395000, or leave your number and we'll call you straight back.